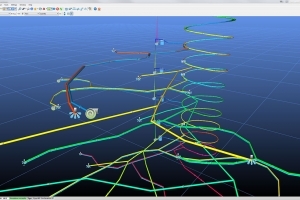 Detailed 3D visual simulations of pipe networks & pumping systems moving at real-time speed through models. Predict performance & suitability of different pipes & pumps. Pumpsim has been developed by the same team that developed Ventsim 3D Mine Ventilation Simulation software. It was designed to tackle the common problem of poor water reticulation design within the mining, construction and other industrial environments which often leads to unreliable water supply systems. This may result in insufficient water supply or pressure, pipe breakage, poor pump performance and productions delays. These problems can be solved by the software as it ensures pumps and pipes are correctly sized and rated, and that pipe and pump design is optimal for all required activities. 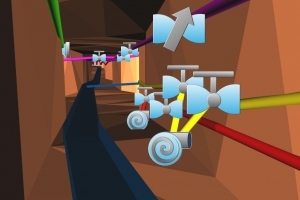 It also shares many of the same popular intuitive user interface features as Ventsim, providing a detailed 3D visual simulation of pipe networks and pumping systems. It allows full 3D modelling with integrated features such as smooth rotation, zoom and pan, as well as real-time animation of liquid/slurry flows through the model. You can always be confident of the safe, continuous supply and removal of water at correct pressures and flows, eliminating costly downtime by ensuring your reticulation systems are correctly designed with Pumpsim. Pumpsim Standard: Liquid is a low cost, steady state modelling tool for fluid flow prediction through pipes, pumps and channels. Predict Flows & Pressures – Steady state modelling shows estimated flows and pressures. Model & Design – Performance and characteristics of different fluids and slurries. Find Shortfalls – In water delivery or extraction through undersized or poorly designed systems. Estimate Pump Size & Performance – Predict performance and suitability of different pumps. Interactive 3D User Interface – High speed 3D display and navigation in real world scale. Animated Flows & Pumps – Visualise flows and movement at real-time speed through models. 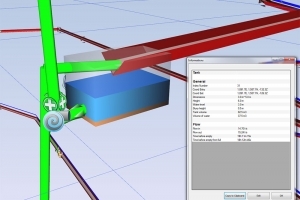 Graphics Import – Import centrelines and solids from CAD packages for rapid building of Pumpsim networks. Overlay complex 3D CAD designs for further visualisation aids. Up to 10,000 Network Pipes – Build large-scale models as part of the design phase or to replicate your existing networks. Pumpsim Advanced: Liquid is a powerful steady state and dynamic (time-based) modelling tool for incompressible fluid flow through pipes and pumps. Model complete systems at different times with different demands. Predict energy and use profile over days or weeks. Supports non-Newtonian such as thick slurries and paste fill. Graph any activity demand (dam levels, pump activity etc.) over time to view performance. Ensure pumps, storage tanks and dams are correctly sized for peak demands. Simulate events such as flooding or high equipment use to highlight system demand shortfalls at different times. Implement and test simple or complex rules to change the systems in response to events (stop/start machines, open/close valves at different water levels). Pumpsim Standard: Gas is a low cost, steady state modelling tool for gas and compressed airflow prediction through pipes and compressors. Pumpsim Advanced: Gas is a powerful steady state and dynamic (time-based) modelling tool for gas and compressed airflow prediction through pipes and compressors. Model complete system performance at different times with different demands. Predict energy and electricity use profile over days or weeks. Ensure compressors and receivers are correctly sized for peak demands. Highlight system demand shortfalls at different times. Implement and test simple or complex rules to change systems in response to events (stop/start machines, compressors, open/close valves at different pressures etc.). The complete suite of all features in Standard and Advanced versions including both incompressible LIQUID flow and compressible GAS flows, in both steady state and dynamic configurations. Run different fluids and gases simultaneously in the same model.